I have been wrestling with the design for Arabesque #3 for weeks now. I kept trying to talk myself out of doing it. The inspiration for the design is from the Alcazar Palace in Seville, Spain (Broug, Eric. 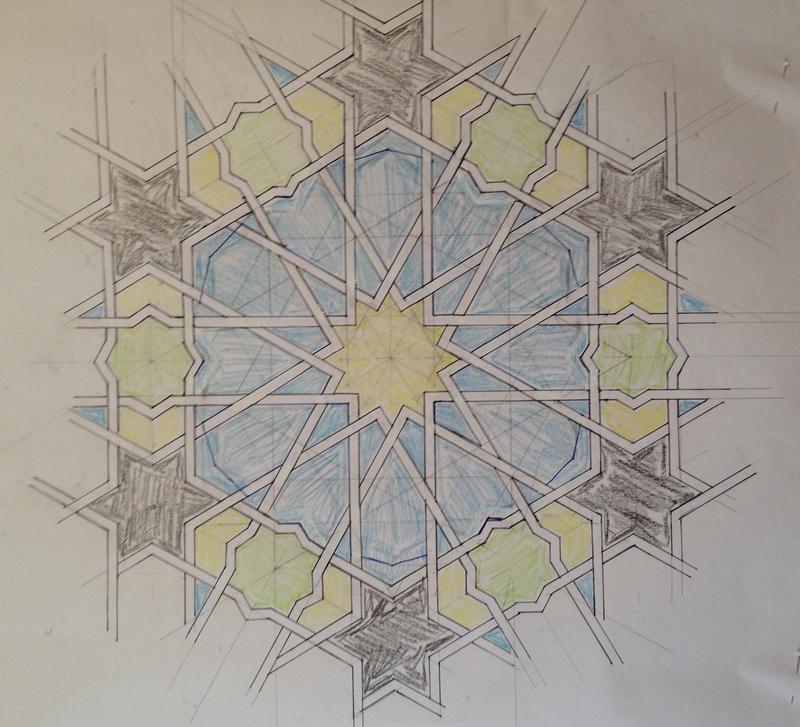 Islamic Geometric Design, pg. 27) and it is complicated. It’s a 12-point star inside a hexagon with 6- and 8-point stars around it. I kept saying to myself, “Surely you can find something easier…” But, I just couldn’t get this design out of my head. So, I kept at it. I erased lines. I started over completely. I walked away A LOT. I prayed for a little divine intervention. Thankfully, the gods smiled down on me and I finally finished the design today. And now, of course, I have to figure out whether it’s possible to sew it.